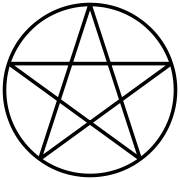 The pentagram within a circle; a symbol of faith used by many Wiccans. Wicca (Old English for "male witch"; feminine wicce), also known as the "Old Religion," is a Neopagan religion characterized by secret initiation rituals, reverence for Mother nature, and worship of the Goddess. The movement received public attention in 1954 when a British civil servant named Gerald Gardner claimed that Wicca had secretly existed for thousands of years, originating in the pre-Christian Paganism of Europe. Various related Wiccan traditions have since evolved from Gardner's time, with their own specific beliefs, rituals, and practices. Outsiders often assume that Wicca is a form of black-magic and superstition, but insiders claim that Wicca is a modern version of the ancient practice of honoring the Mother Goddess found in creation and nature. Due to the open and uncontrolled structure of the religion there are no precise statistics for Wicca; however, estimates range between 50,000 and 800,000 practitioners world-wide. The exact beginnings of Wicca are obscure and the history of Wicca is much debated. According to Gardner, Wicca is rooted in the ancient matriarchal Pagan religions of prehistoric Europe. These pagan traditions, he claimed, were handed down secretly over generations. Eventually, he alleged, they were taught to him by a woman known either as "Dafo" or "Old Dorothy." Doreen Valiente identified these as a single person, Dorothy Clutterbuck, however modern researchers such as Philip Heselton have theorised that Dafo and Clutterbuck were two separate individuals. It has been posited by authors such as Aidan Kelly and Francis X. King that Gardner himself invented it, following the thesis of Dr. Margaret Murray and sources such as Aradia, or the Gospel of the Witches by Charles Godfrey Leland, and incorporating practices of ceremonial magic. While Clutterbuck certainly existed, Ronald Hutton concluded that there was no evidence for her involvement in Gardner's Craft activities. Since then, however, new evidence presented by Philip Heselton makes her involvement seem more likely, and suggests that while Gardner may have been mistaken about the ancient origins of the religion, his statements about it were largely made in good faith. Another theory suggests that after Gardner retired from travel, he encountered Clutterbuck and her New Forest coven in that region. He was supposedly initiated into the New Forest coven in 1939, where he stayed for years until England's ban on witchcraft-related books was repealed. At this point, and later claiming to fear that the Craft would die out, he worked on his book Witchcraft Today, releasing it in 1954. He followed it with The Meaning of Witchcraft in 1960. It is from these books that much of modern Wicca is derived. Due to literary correlations, it is seems very likely that many of Gardner's rites and precepts were adapted from other occultists, particularly Aleister Crowley, and were not in fact anything new. There is very little in the Wiccan rites that cannot be shown to have come from earlier extant sources. As well, the idea of a supreme Mother Goddess was common in Victorian and Edwardian literature: The concept of a Horned God—especially related to the gods Pan or Faunus—was less common, but still significant. Both of these ideas were widely accepted in academic literature and the popular press at the time. Gardner used these concepts as his central theological doctrine and constructed Wicca around this core. Wicca has developed in several ways since it was first openly discussed by Gerald Gardner. Gardnerian Wicca was an initiatory mystery religion, admission to which was limited to those who were initiated into a pre-existing coven. The Book of Shadows, the grimoire (a book of magical knowledge) that contained the rituals (originally written by Gardner), was kept secret and was only obtainable from a coven of proper lineage. Despite the fact that several versions of the Book of Shadows have now been publicly published, many traditions of Wicca still maintain strict secrecy regarding the book and certain other aspects of the religion. Raymond Buckland (an initiate of Gardner) introduced modern Wicca to America after moving to Long Island in the 1960s. Interest outstripped the ability of the mostly British-based covens to train and propagate members; the beliefs of the religion spread faster by the printed word or word of mouth than the initiatory system was prepared to handle. In the 1960s another brand of Wicca was built around practitioners Alex and Maxine Sanders, who, like Gardner, were British. The movement became known as "Alexandrian Wicca" (as opposed to Gardnerian Wicca). Alexandrian Wicca had a stronger focus on ritual magic, and its founders spent much time initiating in continental Europe. This new growing movement was characterized by the flamboyance of its leaders, and Gardnerian Wiccans initially met it with contempt. However, by the late 1980s the two movements reconciled, and though they are not united as a single organization, both acknowledge the other as legitimate branches of Wicca. Most initiated Wiccans can trace their initiatory lineage back to Gardner or one of the Sanders. Another significant development was the creation by feminists of "Dianic Wicca," or feminist Dianic Witchcraft. This is a specifically feminist faith that discarded Gardnerian-style hierarchy as irrelevant. Many Dianic Wiccans felt that witchcraft was every woman's right and heritage to claim. This tradition was comparatively (and unusually for late 1960s Wicca) open to solitary witches. Rituals were created for self-initiation to allow people to identify with and join the religion without first contacting an existing coven. The movement introduced important innovations, but a focus on solitary practice prevented the growth of a unified organization. Since the emergence of modern Wicca in the 1950s, Wiccans have met with a great deal of popular and academic criticism. The association of Wicca with witchcraft has aroused suspicion and contempt in many people, and has forced many Wiccans to practice in secret. The age claims of Wicca have also been disputed by scholars, who find little in modern Wicca that is congruent with the ancient rites being emulated. However, the religion is slowly being recognized internationally by governments and individuals, and there is a growing sense that problems with the historicity of Wicca do not impact the needs and practices of modern Wiccans. Because there is no centralized organization in Wicca, and no single "orthodoxy," the beliefs and practices of Wiccans can substantially vary, both between individuals and between traditions. Typically, however, the main religious principles, ethics, and ritual structures are shared, since they are key elements of both traditional teachings and published works on the subject. Wicca is a religion, and although its adherents often identify as witches, Wicca and witchcraft are not the same. Wiccans may worship a Goddess and/or a God and they observe the festivals of the eight Sabbats (holy days) of the year and the full-moon celebrations (Esbats); and most follow a similar moral code. Wicca is thus generally considered to be distinct from witchcraft, which does not of itself imply any specific religious, ethical, or ritual elements, and is practiced in various forms by people of many religions. Wicca does, however, incorporate a specific form of witchcraft, with particular ritual practices, involving the casting of spells, herbalism, divination, and other forms of magic. Wiccan ethics require that magical activities are limited to good purposes only. However, not all practitioners of Wicca choose to perform or necessarily believe in witchcraft. According to Gerald Gardner, the religion derives from a secret but widespread witch-cult of early modern Europe, which incorporated all of the key religious beliefs, ideals, and the distinctive ritual structures found in modern Wicca. While this historical interpretation is much criticized, it makes it difficult to conclusively say whether Wicca is a religious form of witchcraft or a religion incorporating witchcraft. Wiccans often feel a connection and solidarity with witches and pagans of bygone eras, especially those that faced persecution, such as the "Burning Times" (the witch hunts of early modern Europe) or the Salem witch trials. It is commonly understood that most Wiccans worship two deities: The Goddess, often associated with Gaea or Mother Earth, and her consort, God. These two deities are usually thought of as equal complements to each other, and together represent all aspects of the universe. Depending on the tradition followed, the names of the God and Goddess vary widely, usually based on mythological figures, such as Diana or Pan. Some Wiccans simply refer to them as "The God and The Goddess." Other names are often adapted from mythologies around the world; however, this multitude of names is seen as simply different names from different cultures for the same ultimate reality. The partnership of the Wiccan Goddess and God is generally viewed as dynamic and complementary, with neither dominating; however in some traditions, such as Dianic Wicca, the Goddess alone is worshiped. In those traditions, the God plays either no role or a diminished role. A significant number of Wiccans from various traditions do not claim to be dualist, but practice some form of polytheism, often with particular reference to the Celtic pantheons. They may also be animists, pantheists, or indeed anywhere within the broad spectrum of Neopagan forms of worship. There are different thoughts in Wicca regarding the Elements. Some hold to the ancient Greek conception of the classical elements (air, fire, water, earth), while others add a fifth or quintessential element, spirit (aether). The five points of the frequently adorned pentagram symbolize, among other things, the four elements with spirit presiding at the top. The pentagram is the symbol most commonly associated with Wicca in modern times. It is often circumscribed—depicted within a circle—and is, except in specific contexts, shown with a single point upward. Each of the four cardinal elements (air, fire, water and earth) are typically assigned a direction, a color, and an elemental spirit. The elements are revered in Wicca as the primordial stuff from which all creation can exist, similar to the classical Chinese understanding of Yin and Yang. Despite the popular negative connotations associated with witchcraft, Wiccans see their use of witchcraft as positive and good, and evil magic is viewed as antithetical to Wiccan beliefs and activities. In all areas of behavior, magical or otherwise, Wiccan morality can be summarized in a principle that is commonly titled "The Wiccan Rede." The core maxim states "An it harm none, do what thou wilt" ("An" is an archaic word meaning "if")—a rephrasing of the Golden Rule. The similarity of the phrasing of the Rede (and explicit and verbatim phrasing of other texts) suggests that this statement is partly based on the Law of Thelema as stated by occultist Aleister Crowley, although such influence is never admitted in Gardner's writings. The Rede is found in many Wiccan works, including Gardner's, and is the beginning or core of an expanded explanation of morality. Many Wiccans promote the "Law of Threefold Return," a belief that anything that one does will be returned to them threefold. In other words, good deeds are magnified in like form back to the doer, and so are ill deeds. Many Wiccans also seek to cultivate the Eight Wiccan Virtues as a guideline for their deeds. These are Mirth, Reverence, Honor, Humility, Strength, Beauty, Power, and Compassion, and are found in a phrase from Doreen Valiente's Charge of the Goddess, where they are ordered in pairs of complementary opposites, reflecting a dualism that is common throughout Wiccan philosophy. A recurrent belief amongst Wiccans is that no magic should be performed on any other person without that person's direct permission (excepting pets, which cannot give explicit permission for such an act). This may stem from the Rede's declaration of "An it harm none, do what thou wilt," in that a person may not wish to have a spell cast upon them, and doing so without first obtaining permission interferes with their free will, which falls under the meaning of the word "harm" as understood in the Rede. Some practitioners of traditional initiatory Wicca believe that the term "Wicca" only correctly applies to an initiate of a traditional branch of the religion (such as Gardnerian or Alexandrian Wicca), as solitary Wicca or eclectic Wicca are different in practice from the religion established by Gardner. However, the term has increasingly come to be adopted by people who are not initiates of a traditional lineaged coven. These "non-initiatory" Wiccans may undertake rituals of self-dedication, and generally work alone as solitary practitioners, or in casual groups, rather than in organized covens. Thus non-initiatory Wicca shares some of the basic religious principles, ethics, and the ritual system of traditional or initiatory Wicca, but not the organizational structure, or the belief that Wiccan initiation requires a transferral of power from an initiator. Therefore, some practitioners of traditional initiatory Wicca have adopted the term "British Traditional Wicca" to differentiate themselves from this movement. Some Wiccans join groups called covens. Others work alone and are called solitary practitioners. Some solitaries do, however, attend gatherings and other community events, but reserve their spiritual practices (Sabbats, Esbats, spell-casting, worship, magical work, etc.) for when they are alone. Some Wiccans work with a community without being part of a coven. Many Wiccan traditions hold that the ideal number of members for a coven is thirteen, though this is an ideal and not a rule. When covens grow beyond their ideal number of members, they often split into multiple covens, yet remain connected as a group. A grouping of multiple covens is known as a grove in many traditions. When someone is being initiated into a coven, it is also traditional to study with the coven for a year and a day before their actual initiation into the religion. Some solitary Wiccans also choose to study for a year and a day before dedicating themselves to the religion. Wiccans can also be "promoted" into higher ranks such as head priestess or head priest. Rank may be shown through colored cords. Initiation ceremonies can include a dramatic aspect, such as a dramatic re-enactment of a myth (also known as sacred drama), a pageant, or a dramatic reading. 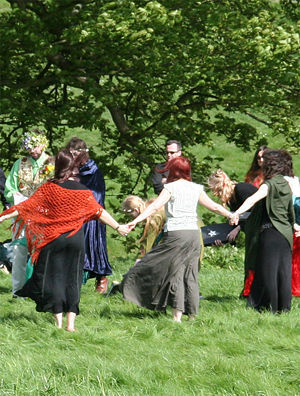 A handfasting ceremony at Avebury in England, on Beltane, 2005. In typical rites, the Wiccans assemble inside a magic circle, which is marked using various means, in a ritual manner, followed by a cleansing and blessing of the space. Prayers to the God and Goddess are said, and spells are sometimes worked. Traditionally, the circle is followed by a meal. Before entering the circle, some traditions fast for the day, and have a thorough wash as a means of purification. Many Wiccans use a special set of altar tools in their rituals; these can include a broom (besom), cauldron, chalice (goblet), wand, Book of Shadows, altar cloth, athame (ritual dagger), boline (sickle-like knife for collecting herbs), candles, and/or incense. Representations of the God/Goddess are often also used, which may be direct, representative, or abstract. The tools themselves have no innate powers of their own, though they are usually dedicated or charged with a particular purpose, and used only in that context. For this reason, it is usually considered rude to touch another's tools without permission. A sensationalized aspect of Wicca, particularly in Gardnerian Wicca, is that some Wiccans practice naked (or "skyclad"). Though many Wiccans do engage in rituals while skyclad, others do not. Some Wiccans wear a pure cotton robe, to symbolize bodily purity. Others wear normal clothes or whatever they think is appropriate. Wiccans typically mark each full moon (and in some cases new moons) with a ritual called an Esbat. They also celebrate eight main holidays called Sabbats. Four of these, the cross-quarter days, are greater festivals, coinciding with old Celtic fire festivals. These are Halloween (or Samhain), May Eve or Beltane (or Beltaine), Candlemas (or Imbolc, Imbolg, Oimelc), and Lammas (or Lughnasad, which is pronounced LOO-nah-sah). The four lesser festivals are the Summer Solstice (or Litha) and Winter Solstice (or Yule), and the Spring and Autumn Equinoxes, sometimes called Ostara (or Eostar or Eostre) and Mabon. The names of these holidays generally coincide with (or directly draw upon) ancient pan-Germanic and pan-Celtic holidays held around the same times. Wiccan weddings can be called "bondings," "joinings," or "eclipses" but are most commonly referred to as "handfastings." Some Wiccans observe an ancient Celtic practice of a trial marriage for a year and a day, which some traditions hold should be contracted on Lammas (Lughnasadh), a sabbat celebrating harvest, although this is far from universal. This practice is attested from centuries ago in the fourth and fifth volumes of the Brehon law texts, which are compilations of the opinions and judgments of the Brehon class of Druids (in this case, Irish). The texts as a whole deal with a copious amount of detail for the ancient Celtic tribes in the British Isles. ↑ Gerald B. Gardner, Witchcraft Today (Lake Toxaway, North Carolina: Mercury Publishing). ↑ Adherents.com, White Supremacist Groups-Other, Continued…. Retrieved June 15, 2007. ↑ Doreen Valiente, The Search For Old Dorothy (London: Hale, 1984). ↑ The Celtic Connection, What is Wicca? Retrieved June 15, 2007. ↑ Ellie Crystal's Metaphysical and Science Website, The Wicca Reed. Retrieved June 15, 2007. ↑ Janet Farrar & Stewart, Eight Sabbats for Witches. Gardner, Gerald B. Witchcraft Today. Mercury Publishing. Janet Farrar & Stewart. Eight Sabbats for Witches. Melton, J. Gordon and Poggi, Isotta. Magic, Witchcraft, and Paganism in America: A Bibliography, 2nd ed. Garland Publishing, 1992. O'Donovan, J., O'Curry, E., Hancock, W. N., O'Mahony, T., Richey, A. G., Hennessy, W. M., & Atkinson, R. (eds. )Ancient laws of Ireland, published under direction of the Commissioners for Publishing the Ancient Laws and Institutes of Ireland. W.S. Hein, 2000. ISBN 1575885727. Valiente, Doreen. The Search For Old Dorothy. Hale, 1984. Berger, Helen A. A Community of Witches: Contemporary Neo-Paganism and Witchcraft in the United States. Columbia: University of South Carolina Press, 1999. Bloch, Jon P. New Spirituality, Self, and Belonging: How New Agers and Neo-Pagans Talk About Themselves. Westport: Praeger, 1998. Harvey, Graham. Contemporary Paganism: Listening People, Speaking Earth. New York: New York University Press, 1997. Hume, Lynne. Witchcraft and Paganism in Australia. Melbourne: Melbourne University Press, 1997. Lewis, James R., ed. Magical Religion and Modern Witchcraft. Albany: State University of New York Press, 1996. Luhrmann, T. M. Persuasions of the Witch's Craft: Ritual Magic in Contemporary England. London: Picador, 1994. Oldridge, Darren, ed. The Witchcraft Reader London and New York: Routledge, 2002. Pearson, Joanne, Richard H. Roberts, and Geoffrey Samuel, eds. Nature Religion Today: Paganism in the Modern World. Edinburgh: Edinburgh University Press, 1998. Pike, Sarah M. Earthly Bodies, Magical Selves: Contemporary Pagans and the Search for Community. Berkeley/Los Angeles: University of California Press, 2001. Rountree, Kathryn. Embracing the witch and the goddess: Feminist Ritual-Makers in New Zealand. London and New York: Routledge, 2004. Salomonsen, Jone. Enchanted Feminism: The Reclaiming Witches of San Francisco. London and New York: Routledge, 2002. Wicca, the Religion - from ReligiousTolerance.org. This page was last modified on 6 August 2013, at 17:33.